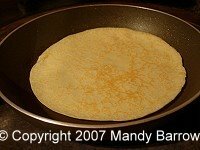 In the UK, Shrove Tuesday is also known as Pancake Day (or Pancake Tuesday to some people) because it is the one day of the year when almost everyone eats a pancake. What happens on Pancake Day in England? Read on to find out why we eat pancakes on Shrove Tuesday and other facts about this special time of year. Lent is a time of abstinence, of giving things up. So Shrove Tuesday is the last chance to indulge yourself, and to use up the foods that aren't allowed in Lent. Pancakes are eaten on this day because they contain fat, butter and eggs which were forbidden during Lent. When is Shrove Tuesday (Pancake Day)? Shrove Tuesday is celebrated the day before Ash Wednesday and is therefore the final day before the commencement of Lent, a Christian festival leading up to Easter Sunday (Easter Day). Why do Christians call the day 'Shrove Tuesday'? What is an English Pancake? A pancake is a thin, flat cake, made of batter and fried in a pan. being cooked in a frying pan. Brazil - Terça-feira gorda - Fat Tuesday - the final day of Brazilian Carnival. Greece - Apocreas, which means "from the meat" since they don't eat meat during Lent, either. Sweden - Fettisdagen (Fat Tuesday). USA In Catholic and French-speaking parts of the United States this day is called Mardi Gras. In France they call it Mardi Gras, which means Grease or Fat Tuesday. In Iceland the day is known as "Sprengidagur" (Bursting day). 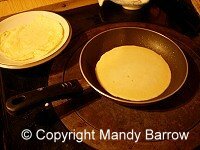 Click here to find out how Pancake day is celebrated in other countries around the world. "I was searching for a simple explanation of Shrovetide and Lent for my 6 year old daughter. I was very lucky to find your website first." "I found your site while looking up Shrove Tuesday. In the U.S.A., most Protestants don't celebrate Lent, so I knew nothing about it. I homeschool my children and after reading about it, we will have Pancakes today and discuss the history and meaning of Lent. Great site!" "I must compliment you on the clear and informative style of your presentation. As a Christian believer of many years, and also a retired secondary school teacher I am pleased to note that a school is prepared to present information about the Christian festivals which is so desperately needed in our country today. Many people do not know about these festivals let alone having any experience of faith,regular worship, or attending church on a Sunday. "